Last year I found the first day of school crept up on me and I stood there without so much as a "Yay! It's the first day!" Not even a blinkin' picture. What kind of mother does that? This kind. I was determined that I would not let this year go by without doing something special to commemorate the day. Something... anything. Getting back to school (even if you've been doing it over the summer like us) is a fun event! It's the time of new beginnings and fresh starts. As Homeschoolers back to school is just as fun and important as non-homeschoolers. Enter research time! Wow, did I find some great ideas! I wanted to share them with y'all. I decided to put them in all one spot so you wouldn't have to go searching and searching like I did. Now you'll just have to click and click. Trust me, I've found some goodies for y'all! 1. 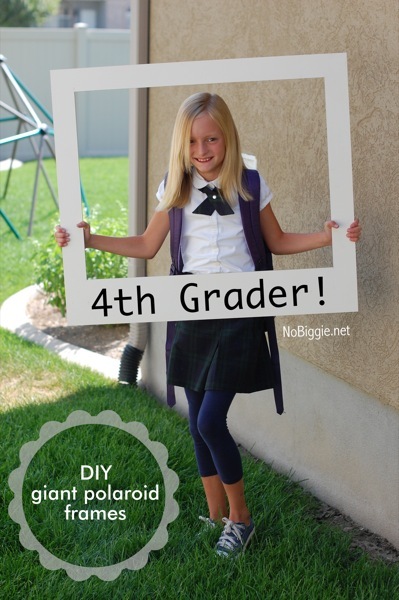 Giant Polaroid Make your own polaroid frame photo prop. 2. Pencil Prop Cute giant pencil photo prop. 3. Chalk speech bubble Fun DIY sign. 4. Same outfit on first and last day of school. See how they've grown! 5. Chalkboard sign Make your own sign with a canvas and some paint. Personalize with their details. 6. Photo checklist Not all of these photo ideas are for homeschoolers. You can adapt the list to suit your situation. Have fun with it! 11. Graduating year T-shirt Make a T-shirt for their graduating year and take a photo with them in it every year as they grow up. 12. Chalkboard sign A framed chalkboard. 13. Large Printable Sign This one is editable with photoshop and she printed it at a copy shop. 14. Sidewalk chalk Make a grade year sign on the sidewalk. Add in some personal details or fun pictures. Pose away! 15. Paperstrip backdrop Cute backdrop for some pop of color. 16. Mini Chalkboard Such a cute little chalkboard. 17. Mom holding all the signs of each kid Show what grades mom is teaching this year! 18. Printable Bus Sign Cute school bus sign. 21. Interview made into a special page Ask your questions and design them into a pdf or pretty document to print and keep. 22. 21 questions to ask Great questions to ask. Put them on video or write them down. Or be crazy and do both. 23. First and Final Day Ask your kid the same questions at the start and end of the year. 24. Printable interviews Free printable for each grade level. 25. Back to school Survey Another fun set of questions. 26. K-12 Printable interviews More I tell you, more! 27. My summer printable What did you do this summer interview! 28. first and last day memory page Put your memories down on paper! 30. When I Grow Up Fun idea for what you want to be when you grow up party. 31. Ice Cream Party Who doesn't love ice cream? Don't answer that. I"ll just pretend I didn't see that. 32. Dessert Party Desserts people, desserts! 33. Apple Party Cute classic apple theme. 34. "Be Brave" I love this idea. Be Brave is their slogan for the year. 35. Going Places Great theme. 37. Coffee Date for Moms A fun celebration for the moms and dads to celebrate the start of a new year. 38. "Future is Bright" Another fun theme. 39. Milk and Cookies party Milk and cookies people, milk and cookies! Classic after school snack! 40. 50 more Celebrations Dude, my hand would've cramped if I tried to post more of these. I ♥ Naptime did it for me. 41. Lunch box notes Gotta love lunch box notes! 42. decorated lunch bag Make their brown bags look extra fun. 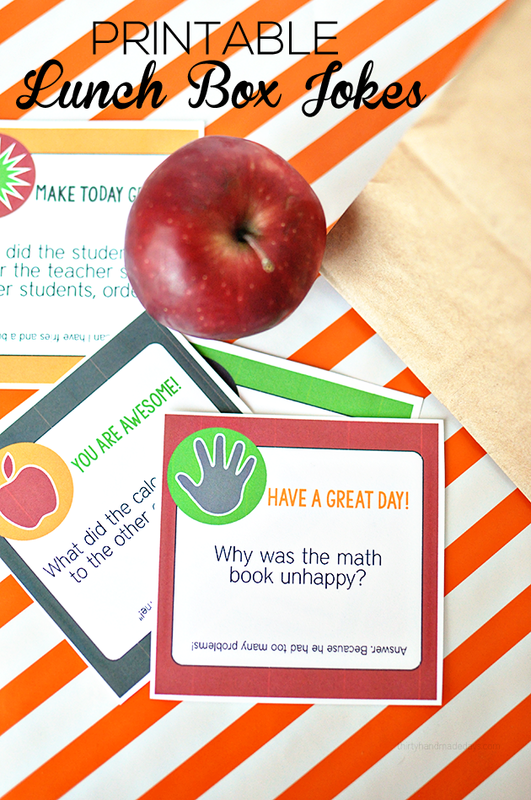 44. lunchbox notes Love fun printables! 45. lunchbox jokes Jokes! Who doesn't love a good laugh? Your kiddo could use some cheering up. 46. owl lunch bag Another fun way to decorate the classic brown bag. 47. back to school luncheon Celebrate with a special lunch. Invite some homeschool families. 48. back to school dinner Special dinner either the night before of the night of. 49. back to school breakfast Have a feast! 50. back to school bash Invite the friends over! 51. breakfast butterflies Cute special breakfast meal. 52. back to school feast !ith crowns! Cute treat bag full of whatever goodies you want! School supplies, treats, gifts, whatevs. 53. Back to School Fairy visit Have her visit the morning of. 54. Fairy Treat bag Have her visit the night before. 55. Magic School Bus Same idea, but it's no fairy, it's a Magic Bus, baby! *cringe* Sorry about the cheesiness. 56. First Day Ribbons Little badges for them to wear with their new grade! 57. Decorate a Composition Notebook Decorate a notebook for them to use all year long. 58. Craft Stick Bookmarks They're designed to look like pencils, crayons, or super heroes. 59. Decorate Journals Make journals together! 60. School binders Have a special binder just for them. 61. First day Certificates These are just for your preschooler and kindergartener. 62. 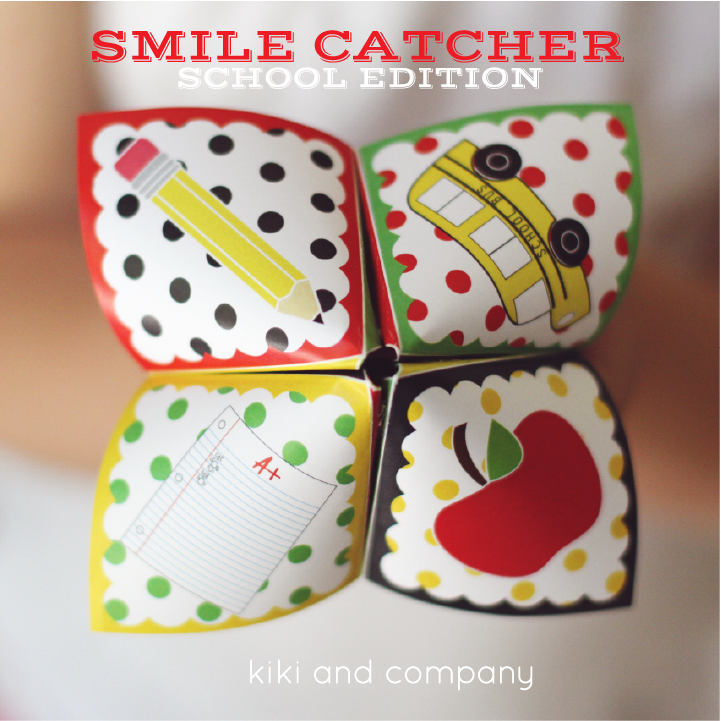 Smile catchers Fun little toy you can put in their lunch box. You know those folded thingys you used to say who your crush was and all that fun stuff. What's its name? 63. Back to School Mad-Libs Who doesn't love a good mad lib? 64. Washi tape bookmarks, clothespins, thumb tacks, dry erase board, and labels Lots of cute supplies you can make with washi tape. 65. Crayon Favor Box Cute cute giant crayon stuffed with whatever treat you want to put in. 66. Button Book Marks Sweet little things! 67. Personalized Pens Decorate a boring ole pen. 69. Personalized Pencil Cans In the post they aren't personalized, but you could definitely make one for each child. 70. bottle cap magnets Such a fun thing. If they have a locker, a magnet board, or anything really. 71. School supply crate A fun idea to decorate their curriculum/supply box. 72. Dry Erase Clipboard Could be a great tool for keeping them on task. 73. Printable bookmarks Cute easy bookmarks! Free! 74. mini chalkboard easels Cute little gift. 75. Survival bag Scroll down a bit in the post to see it. 76. First Day Survival Kit Gotta survive that first day! 77. pencil can with pencils Make a fun pencil can and then fill it with fun pencils! 78. Back to school pencil cases Love pencil cases! 79. notebook cover Fun way to cover a notebook. 80. Schultute A cute way to give a bunch of gifts. Could be used along with the BTS Fairy. 81. back to school bag Great idea. 82. school tools Fun fun! Fill it with whatever supplies they love. 83. Lucky Charms goody bag Cute little cereal bag. 85. Gumball Rulers So clever! You gotta check it out. 87. Confidence Cookies I hearts and flowers this idea. 88. Edible Glue Stick What a cute idea - a fake glue stick filled with white candy! 90. 7-up treat Cute little saying to go along with the 7-Up! 91. bookworm cupcakes So cute. There's a couple more cupcake ideas on this post as well. 92. tic tac printables Cute little printables to put on a Tic Tac box. 93. apple cake pops So cute! 94. back to school cookies She did a fabulous job on these cookies! 95. edible crayons Such a fun idea to make together. 96. Back to school cupcakes Cupcakes! Love!! 97. hershey kiss pencils These are so cute. Big pencils but with candy instead of graphite. Win! 98. apple jelly bean treat Super cute! Jelly beans are so yummy. 99. crayon cupcakes Cupcakes made to look like crayons. Love the wrappers. Post has a party idea as well. 100. Countdown paper chain Fun free printable chain! 101. Morning routine printable Great idea to get the kids ready for their day. 102. Alphabet art Cute way to decorate your home. 103. 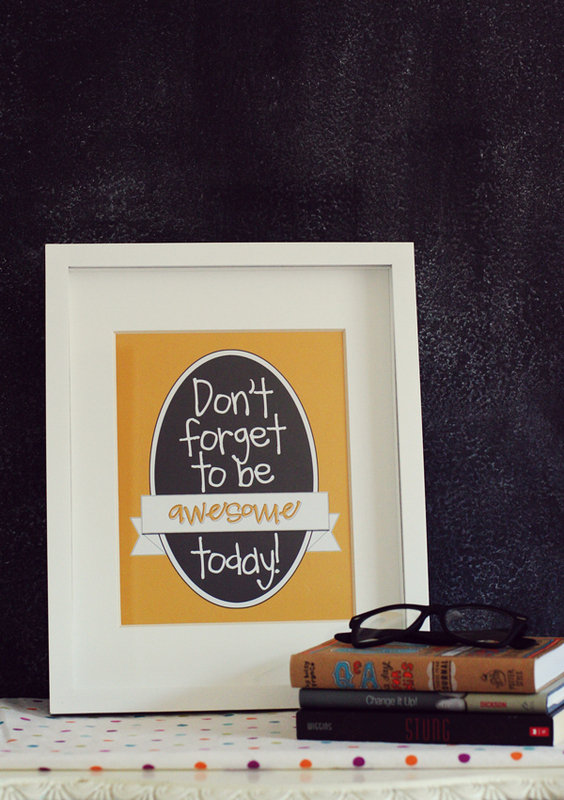 Be Awesome Today print A fun print to keep near your kid's desk. 104. Countdown banner Another fun countdown idea. 105. Back to school printables Lots of cute and practical stuff here: lunch checklist, refrigerator note, daily school clothes labels, and school money. 106. Printable Reading Log A fun printable to keep track of reading. 108. 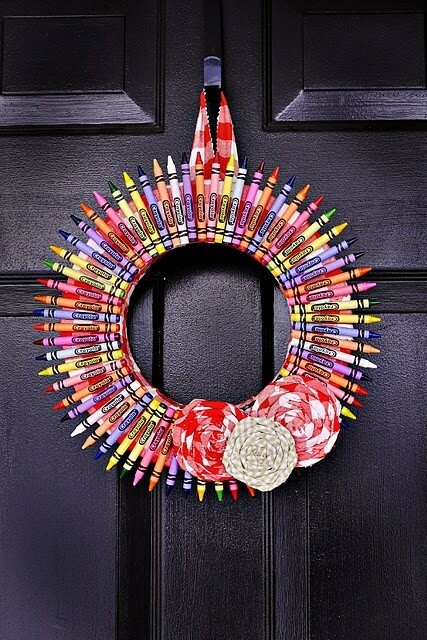 Ruler Wreath I love this wreath! 110. Scavenger hunt for school supplies. 111. Scavenger hunt for a treat at the end. Maybe a gift, or special meal, or a gift card. 112. Make goals with your children. 113. Ask them what they want to learn this year. What are they looking forward to this year? 114. Make a list of "firsts." 116. Draw or paint self-portraits. 117. Homeschool club parties -- some homeschool clubs and co-ops have back to school parties. 118. Field trips - go somewhere fun on your first day back! 119. Do something special that non-homeschoolers can't do!! 120. Go out to eat for breakfast/lunch/dinner. Are you exhausted? I am! Obviously you cannot do them all. If you try I'm calling an asylum and have you committed. I'll visit once a year and bring you a shiny red apple. What are your family traditions for the first day of school? What new ones will you start this year? I'll report back to tell you which ones we decided to try this year!